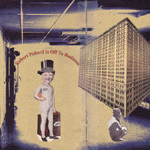 Robert Pollard Is Off To Business will be Robert Pollard's only proper "Robert Pollard" full-length for 2008, released on Robert Pollard's own new label Guided By Voices, Inc. At 10 songs and 35 minutes, it's an extraordinary rock tour-de-force. Robert Pollard Is Off To Business sports Todd Tobias' cleanest and meanest production yet, giant songs and riffs that pack a wallop, and arguably Pollard's finest singing ever captured on record. For Pollard, whose albums normally run 15-25 songs, this 10-song work (the majority of the songs 3:30 or longer) is a departure from form. Since freeing himself of a band in 2004, his albums have each had very distinct and varied flavors, and his creativity has flowered. Collage Name - Back Cover "Complex Lawns"
Collage Name - Front Cover "Off To Business"